I am not a minimalist when it comes to packing. Not a serious minimalist, anyway. I like to take all my creature comforts and I can’t survive with one pair of shoes for all occasions. I’ve tried to subscribe to this “I travel light” philosophy when I was backpacking and it was always a disaster.It seemed like a good idea at the time but at the end of the day I always needed to run around getting first aid supplies and toiletries that I didn’t bring or the right shoes for horse riding. The end result was that I spent too much on incidentals and looked like a vagrant in all of my travel pictures. This is why there are hardly any entries on my trips to Cambodia, Vietnam, Myanmar, Lao or Thailand. I wish I’d just taken pictures of Angkor Wat and left myself OUT of the frame. It’s just too embarrassing. I’ve figured it all out now. No one in the world can pack like I can because I have THE FORMULA! I’ve seen many friends off on successful trips after one of my consultations on how to get the right baggage and contents thereof. I will share my formula with you today. If I was the Minister For Backpacking, Holidays and Adventure Travel I would implement these laws as part of my Vacation and Leisure Act. Get Yourself a Decent Rucksack/Suitcase. What the hell were you thinking getting that piece of crap from K-mart? !It will cost you a fortune in the long run because you will have to replace it once a year when the zipper goes or the wheel breaks off in your hand. Think, kids, THINK! Save up your beer money for a month before you go and get yourself something decent. You can wait till the last minute for this one. Samonsite used to be the world leaders in gorilla-proof travel bags but the last 2 that I’ve bought didn’t even last 2 years.They manufacture a lot of their goods in India and they just aren’t what they used to be. These days, Delsey make some very good and almost indestructable, lightweight hard cases. I recommend Montbell for rucksacks, and my old Northface rucksack did 7 years of hard trekking before I tearfully chucked it when it was in perfect condition – and only then because I never washed it and smelt like Calcutta. Unless you are very large and very strong a 65 litre rucksack is enough for anyone and you can get a lot in there: with a cabin bag and 65 litre pack I am set for 6 months.I have never owned one myself but the REI rolling duffel bags are, apparently, the best $169 I’ll ever spend. The Rei website also have Victorinox and The North Face Luggage which are also very well made – I’ll decide which of these to get when my current Samsonite dies. I bought it at Christmas so it could be anytime soon – it’s certainly my last one! UPDATE, 18/9/10: the Samsonite case is now in the rubbish – the trolley handle no longer retracts and I had to cut it open because the zipper is now shot. 11/11/10:am waiting for a refund, Samsonite promised to do the right thing. January 2011: They paid me. Well done Samsonite! I won’t be slagging you off anymore. Especially if you are going hiking. Don’t take this advice lightly. If you don’t have proper shoes bags then use large Ziploc bags or even supermarket shopping bags. Anything as long as your muddy shoes covered with animal excrement are not wedged in your suitcase with your toothbrush. It always helps to weed out the unnecessary clutter and it makes such a difference: I very rarely forget anything when I have a list. I take it with me on my trip so when I am packing to leave, I don’t leave anything behind either. If you like your drinks cold bring a thermal bag/cooler bag. It’s great for hikes, sightseeing, etc. I carry this little bag which holds on single drink bottle and a gel pack that I freeze.It keeps my water cold for 10 hours!This means I save a lot of money as I don’t spend $5 on a bottle of water at a tourist site in Western Australia or Italy. I can also keep fruit in it overnight for breakfast, or fresh milk for my tea if I am staying in a cave or somewhere without a fridge. Rolling your clothes instead of folding them means less space is used, less creases in clothes and also, you can see what you’ve packed as the rolled up clothes are lying side-by-side in your case. I even roll in my drawers at home. This rule doesn’t apply to anything tailored or with a collar – you still have to fold that. 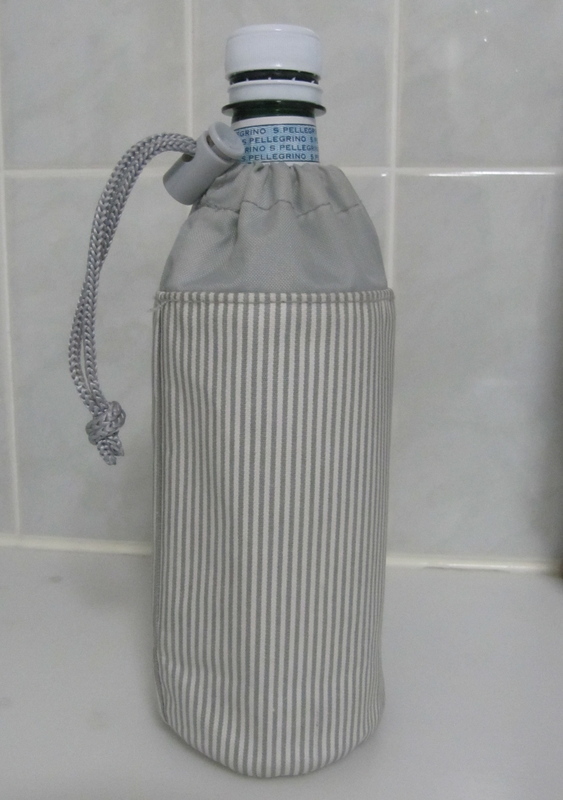 Put your socks inside your shoes and use your evening bag/beach bag/drinks cooler bag for a toiletry bag.Any delicate silk ties or blouses need to go in a Ziploc bag too. Try and roll from the bottom of the garment upwards. Don’t be silly: Pack Only What You Will Wear and Make Sure the Clothes Match! It was the stupidest thing I’d ever done. There are no ladies jeans/trousers in Tokyo that have a 30 -32″ inner leg. I had to buy some knne-length skirts, wear them as mini skirts and fortunately, I bought a pair of tights that I had brought with me (and wash them every day) as Japanese tights and stockings also don’t fit me. … all this as well as a pair of pink trainers and ended up just looking like a vagrant again in a city full of trendy movers and shakers. Things are a bit better now as you can find something at Benetton or Top Shop or Banana Republic but they cost 3 times as much as anywhere else. I also went to Cuba with minimal clothing with the intention of buying some summer outfits. I ended up wearing green lycra minidresses in the hot Havana summer: I have since woken up and pack properly. 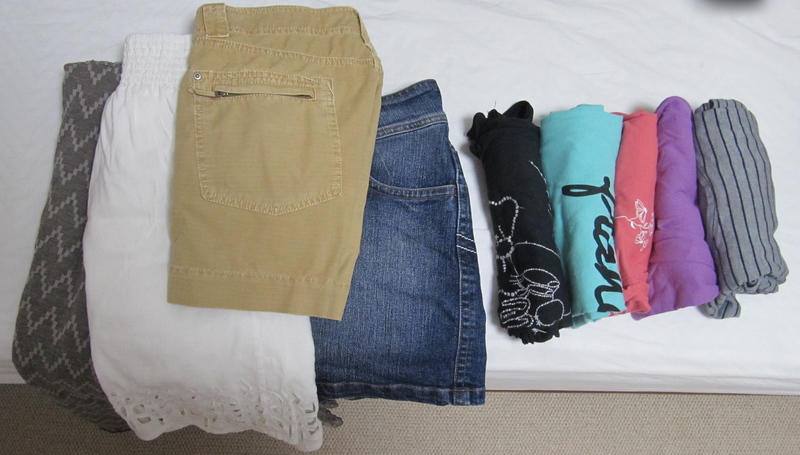 If you are going somewhere hot for 1 week, 3 pairs of bottoms (shorts, trousers, skirts, etc) and 4 tops is enough. You may like to bring a pair of walking shoes and some nice sandals you could wear to the beach and also out at night. That will leave plenty of room for shopping too. There is no difference between packing for a 2 weeks and 3 months: 6 tops, 3 bottoms (4 if you like) and 3 pairs of shoes. If you like variety just buy a new shirt when you get there. There is no need to pack any more stuff, you will never wear it. Write a list and make sure your items work together. Bring travel laundry soap so you can wash your clothes in the sink. I like to make an entrance, so I always travel with a nice pair of earrings, some feathers for my hair and a scarf to change my outfit a bit and make me look more exotic than I really am. Things get trickier if you are travelling ,for example, through France and Malaysia and New Zealand in December as you’ll need trans-seasonal items: long sleeve shirts that can work for both; a long skirt that will do the trick in winter with a pair of tights; Jeans that you can roll up at the bottom. You can wear your short sleeved shirts as undergarments in the colder places.Even on these kinds of trips you still only need 6 tops and 4 bottoms (like a skirt, jeans, cotton trousers and long shorts) and 3 pairs of shoes including flip-flops, flat shoes and maybe boots if you can (wear them on the plane if you have baggage weight issues) and take your jacket with you on the plane too. A jacket that covers your behind is a must for freezing places. Anyway, the point is that there is no need to overpack. This is all I took to Europe and North Africa for a 18-day trip last month (not including what I wore on the plane, underclothes and 3 pairs of shoes) and I had plenty – I still didn’t wear one of the shirts. Of course, it was summer, so I didn’t need anything heavy. I am glad I took so little. I bought 2 dresses and some trousers while I was over there , so it’s just as well I had plenty of space in my case. Sounds simple enough but many people don’t think about this. I often buy pottery or take a Japanese tea pot to a friend I may be visiting and it always goes in my hand luggage because, apart from being heavy, it’s much safer with me than being tossed around in my rucksack or suitcase. There is usually a 7 kg limit for hand luggage and sometimes 10 for business class or upper class.If your bag meets the standard size requirements for hand luggage then no one really cares about the weight. In all my travels I’ve had my hand luggage weighed only once (Cathay Pacific flight from Sydney, the hellwoman at the counter was just being a fascist I think) and if you are worried about the weight of it, leave it with a friend whilst you check in or hide it under the counter. I keep all jewellery and valuables with me too. If it’s really worth that much that you couldn’t bear to lose it then it shouldn’t be coming on the trip with you. Travel insurance, which is necessary for all travellers who do not have a millions dollars to access in case of a medical emergency, is great in an emergency but usually you don’t get the full value of the item if it’s a $3,000 ring. Never Ever Go Anywhere Without A Money Belt/Case! This should be number 1 on the list.I believe this is the reason I have never had things stolen from me: even in super safe places like Tokyo and Bermuda, you should at least take your money case to wear at the airport – I know at least 50 people who’ve had their passports and money stolen at places you’d imagine are very safe.I think the money waist belts are ridiculous, they are hard to get under the waistband of your trousers.The best are the cases with a strap,worn around the neck and beneath an undershirt – noone can get it except you if you pull it out the bottom of your shirt. I like the Victorinox ones because they are thin, skin coloured and have many pockets. if your passport isn’t wrapped in a plastic case wrap it in a ziploc bag so it doesn’t get sweaty under your clothes. Mine is always soft and warm when I hand it to the immigration official. I don’t care – it’s still better than being in someone else’s grubby little hands. If you’ve just done a major shop and have carpets, pots, artwork or even a lot of clothing, check the price of sending it back home. It’s often very cheap to send things by sea or even by air: Japan Post is half the price of Australia Post for parcels and they offer a good service. Anything is better than the excess baggage charges! I won’t leave without them: a good sleeping pill at the start of the journey will stop you wasting the first 2 days of your trip living like a Zombie or falling asleep on the lunch table. Depending on your trip, you may need them for the first or second nights and perhaps one when you return home. Your doctor will be able to tell you which medication is the most suitable for you. This may save your holiday and prevent you from spending days or weeks in an “exotic” hospital. They all get used at some point! No point. I fill 4 hotel bottles with my own shampoo and conditioner and bring samples packets of moisturisers. The 4 little bottles last me more than 2 weeks and I have long hair that I wash every second day.If you need more after this time, then buy some more, fill up your little bottles and chuck the big bottle away. No one needs more than a pencil-case full of makeup either. I always bring my own antiperspirant and sunblock because you never know what’s available where you’re going, and even places like Korea, Japan and Italy can have inferior products in my experience. If you need your own towel make it a travel towel! They look so small and ridiculous but they work as well as a bath sheet and take up 30% of the space in your luggage. They aren’t as luxurious as a regular towel but they do the job. Well done, Theresita!!! I like it!!! well said. add some sunnies. though love on the clothes though. I wish I had read this before I came to Japan. Indeed so do I, Ruby!